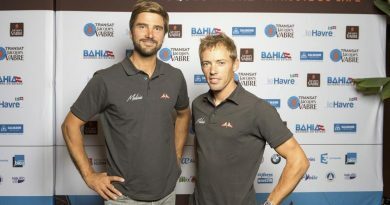 V and B beat the previous record of 22 days 13 hours 2 minutes 22 seconds set by the Italian duo Giovanni Soldini and Pietro D’Ali on Telecom Italia in 2007 (the first time Class40 had been included in the Transat Jacques Vabre and the last time the race went to Salvador) by 05 days 02 hours 18 minutes and 07 seconds. 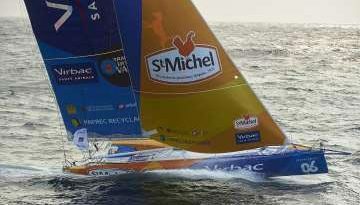 In one of the closest finishes in Transat Jacques History, Aïna Enfance and Avenir (Aymeric Chappellier / Arthur Le Vaillant) finished second, just 17 and 42 seconds behind. 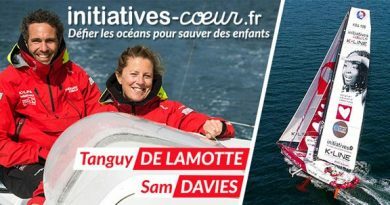 Sorel, who finished second with Sam Manuard, the designer of his (and the second-placed) 40ft monohull in the last edition of this bi-annual double-handed Route du Café, in 2015, only finally moved into the lead in the later afternoon today (Wednesday). And after over 4,500 miles of crossing the Atlantic, Phil Sharp (Britain) and Pablo Santurde (Spain) on Imerys Clean Energy are only 35 miles from the finish line. Sharp and Santurde led the race for 12 days but in a boat that is a generation older than the two ahead was technologically outrun in the final straight in beam reaching conditionas along the coast of Brazil.